By MadJik, February 20, 2018 in Plugins - Publishing ONLY! This is an original plugin made by @jchunn in year 2008. Having a need for a specific use of varicose and as the source code is available, I started some improvements to this effect. I PMed to @jchunn to ask if I could rework this code so... here we are! Original plugin could still be found here. Still interesting as it is a rare plugin in VB! Define a number of starting points on the top of the image then draw a “vein” to the bottom. Veins aren’t straight they move slightly (and randomly) to the left or the right. They could merge when they meet. They could split randomly. A vein is made of two edges (left and right) 50% transparent and a middle section 75% transparent. Left edge uses primary color, Right edge uses secondary color, middle section is a blend between primary and secondary colors. The vein is also blended with the image of the canvas with the intensity.
. Random possibility to divide the lines (not only merging).
. Frequency is the number of starting points (if the width is enough).
. Reseed button, 0=new reseed at each run, any value=unique sequence of random values. Select the primary and secondary colors you want for the veins. 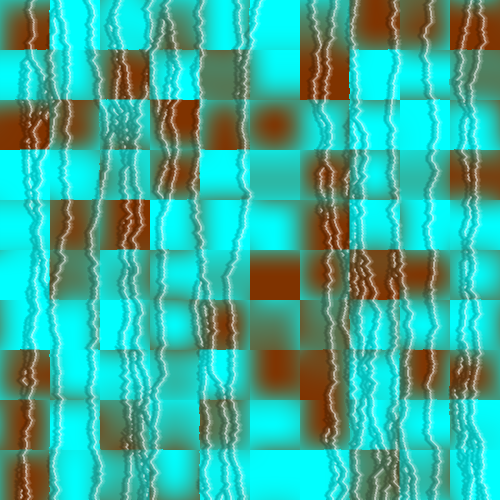 Then run the effect other an image or on a new empty layer. Veins are vertical going from the top to the bottom. Left edge uses the primary color and right edge uses secondary color. Uncheck to use Black (left edge) and White (right edge). Number of start points. It could be less when if the width of the selection isn’t sufficient. Set the width of the vein. This size is shared by the two edge and the middle section. Same value for the two edges. Change the width of the edges. Percentage of chance (random) to start a new vein on each line. Set the start of a serial random numbers. Zero is a new serial each time (full random). Set the level of transparency of the edges. The middle section is a half of the edge level. Check to add a single pixel white line before the right edge. Set the level of quality (antialiasing). It applies only where there is a vein. Other areas of the image remain unchanged. @MadJik! Thank you so much and also thanks for sharing.